All of us – I hope – are familiar with the true meaning of Christmas: the reason for the season, as they say. Every year, on December 25th, millions of Christians gather to remember the birth of Jesus, who is God with us (Emmanuel). For many, this baby is the savior of the world. The one who dies a horrible death on the cross, descends into hell, and rises from the dead. The one who paves the way for our resurrection from the dead by destroying our last true enemy: death. The idea that God would become enfleshed so that he could die for our salvation may seem like a strange idea. It may even seem like an innovation compared to first-century Jewish worship in the Herodian Temple – the time of Jesus. Margaret Barker (a member of the Ecumenical Patriarch’s Symposium on Religion) makes an argument that Christianity preserves practices and theology from the Tabernacle and the first Temple, which was destroyed in 586 B.C. – practices and theology that didn’t get preserved in the second Temple or in Herod’s Temple. 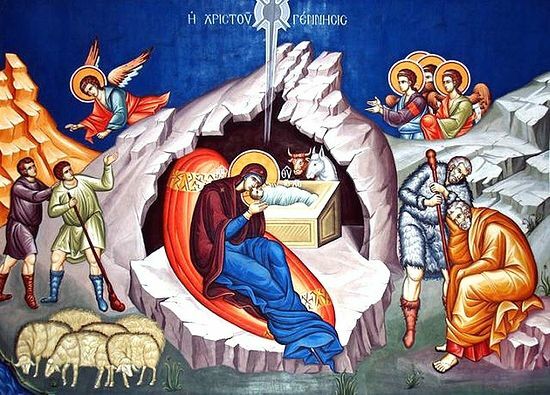 And one of these ancient ideas was the idea of an incarnate God – Christmas before the birth of Christ! To understand how the Jews celebrated Christmas before Christmas, we have to go back to the time just after the Exodus, when Moses freed the Hebrews from Egyptian slavery. Everyone knows the story of Moses and the burning bush, the Hebrews crossing the Red Sea, and Moses receiving the Ten Commandments. However, a part of this story also includes Moses receiving instructions from God about constructing the Tabernacle. The Tabernacle was a large tent, the forerunner of first Temple, and it was in this structure that the Ark of the Covenant originally rested – specifically, within an area called the Holy of Holies. Here, the presence of God dwelled among the Israelites. The Holy of Holies was separated from the rest of the Tabernacle by a large veil or curtain. The veil wasn’t just a curtain that partitioned off the Holy of Holies – the place where the presence, or glory, of God dwelt – it had meaning. The meaning of these colors is collaborated by Philo. Why are the curtains (made) of woven linen and of hyacinth and of purple and of woven scarlet? Thus the veil that concealed the Glory of God represented matter. Now, I would be remiss if I didn’t also point out that the high priest’s vestments were also made out of the same fabrics. Not only was the high priest’s vestments made out of the same material as the veil, but we also know that the vestments also represented matter. Joseph makes mention of this. So, the high priest’s role was associated with created matter. In fact, one could say that the high priest was vested in the stuff of creation. Moreover, when the high priest was vested, he wore the sacred name (YHWH) on his forehead (Exodus 28:36). When fully vested, with the name upon his forehead, the high priest signifies the Lord himself! And, like Christ, the high priest took sin upon himself. So, the fact that the veil and the high priest’s vestments were made out of the same material is key. The vested high priest was the “Lord of Glory” veiled in matter. In other words, he represented the incarnate, enfleshed God – exactly what we celebrate at Christmas: a God who vests himself in matter and makes himself known through creation. We also know that the writers of the Gospels linked the veil to the Incarnation of Christ. When Jesus dies on the cross, the veil also “dies,” ripped in two (Matthew 15:38 and Luke 23:45). St. Paul, in his Letter to the Hebrews, also seems aware of this connection. But this tradition lives on. On March 25th, the Orthodox celebrates the Annunciation, a celebration of the angel Gabriel coming to the Virgin Mary to announced that she will bear a son and call him Emmanuel (Luke 1:26-38). Now, the Gospel of Luke doesn’t say where Gabriel visited Mary nor does it say what Mary was doing when the angel appeared. 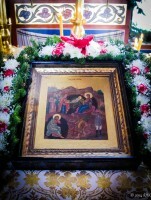 However, in Orthodox iconography, we see that the Virgin is in the Temple. And what is she doing? She’s sewing a new veil for the Temple! In other words, just as she learned that God would become Incarnate, she was working on the very Old Testament symbol of Incarnation! Thus the link between the veil and an enfleshed God carries on within the Orthodox Church. 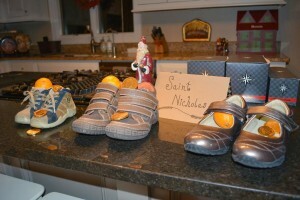 So, did the Jews celebrate Christmas before the birth of Christ? Well, it’s true they didn’t sing Christmas carols, but if by Christmas you mean: did the Jews celebrate God becoming Incarnate? Then, yes, they did! 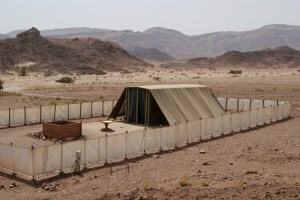 After being freed from Egyptian slavery, God commanded the Israelites to build a Tabernacle, and later the first Temple. Within this Temple was the Holy of Holies, which was where the glory of God descended upon the world and how God lived among his people. The Holy of Holies was separated from the rest of the Temple by a veil, which represented all of created matter. The high priest also wore vestments that were made from the same materials as the veil, thus the high priest, who represented God, become the Lord wrapped in created matter. In all, it foreshadowed the Christmas story, a story of God wrapping himself in created matter to become human. An Orthodox saint, Symeon the New Theologian, pulls it all together very well. And it’s this humility that brings about our salvation! Temple Theology: An Introduction (London: Society for Promoting Christian Knowledge, 2004). Translated by G.A. Williamson (New York: Penguin Books, 1970). Translated by Ralph Marcus (Cambridge, M.A. : Harvard University Press, 1953). Translated by H. St. J. Thackeray (Cambridge, M.A. : Harvard University Press, 1961). Translated by Charles Duke Yonge, http://www.earlychristianwritings.com/yonge/book27.html (accessed, December 20, 2016). Translated by H.N.L. Simmons (Brookline, M.A. : 1984).